How safe is your kitchen? Do you follow safety instructions by the book or is your approach more slap-dash? Take our quick Personal Safety quiz and determine the biggest hazards in your kitchen. Has your Electrical Wiring been Serviced recently? If you haven’t had your wiring checked recently you might be surprised at its state! New regulations demand professional circuitry, better fuse-boxes and proper casings for outdoor sockets. The kitchen is a real hotspot for electrical overload – toasters, kettles, blenders, coffee-makers and washing machines all need a socket! If you use an extension lead or load up sockets with two or three plugs, an electrician could quickly add some sockets to improve general safety. Do you use a Non-Electrical Deep Fat Fryer? Eek! 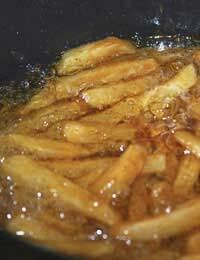 Deep-fat frying is one of the biggest causes of kitchen accidents. A ‘fat fire’ injures an estimated four people every day. This is because fat reaches very high temperatures and the high heat can quickly cause combustion. You only have to step away from the pan for a minute – turn up the radio or take some burgers from the freezer – for a fire to start. If your family eats a lot of chips, invest in a thermostatically-controlled fat fryer (£40-£50)– it will regulate its own temperature, which also avoids smoke. Alternatively, you could use your oven to bake chips. Oven fires are far less dangerous because, if they do start, they will be contained within the oven. If a fire begins in your deep fat fryer – and you are in the room to see it – then turn off the heat, and put a lid on the pan if possible. Are your Matches and Chemicals out of Reach? Matches, lighters, kitchen cleaners, and other toxic fluids should be kept well out of reach of children. RoSPA is campaigning for housing developers to incorporate a lockable kitchen cupboard in every new home they build. If your cupboards are all at foot level, fixing a lock to an existing cupboard is very easy. Gas-burning appliances give out waste gases including carbon monoxide – which can be fatal in large doses. That’s why it is so important to have these appliances serviced. Your CORGI-registered supplier should check vents and pipes to ensure that waste gas is being distributed away from the room. You should keep an eye on these appliances, too: don’t let pilot lights go out, and make sure nothing is blocking vents or grilles (in other words, don’t cover them up with anything). Tip: The gas flame on your oven or hob should burn blue. If it’s burning orange, there could be a gas build-up – get it checked quick. Does your Kettle have a Coiled Wire? Using a kettle with a coiled flex is just one way to prevent scalds or burns. It’s not just children who can catch a dangling wire and pull boiling water over themselves. Similarly, ensure that saucepan handles point inwards (it’s so easy to walk past and knock one) and be extra-careful with fresh tea and coffee. It is common to overlook these problems but a little care could save you from one of the most frequent kitchen accidents. Burns and scalds affect around 80,000 people in the UK every year (RoSPA).